In the closing moments of “Force of Evil,” the air in the room changed when Ortega showed up after Kovacs escaped and killed his captors (and then some). Confronted by him, she was forced to tip her hand that she’s not so much been tracking him, but his sleeve. In “The Wrong Man,” we learn that Kovacs’s sleeve belonged to Elias Ryker, Ortega’s partner at work and home, and she still not over losing him. 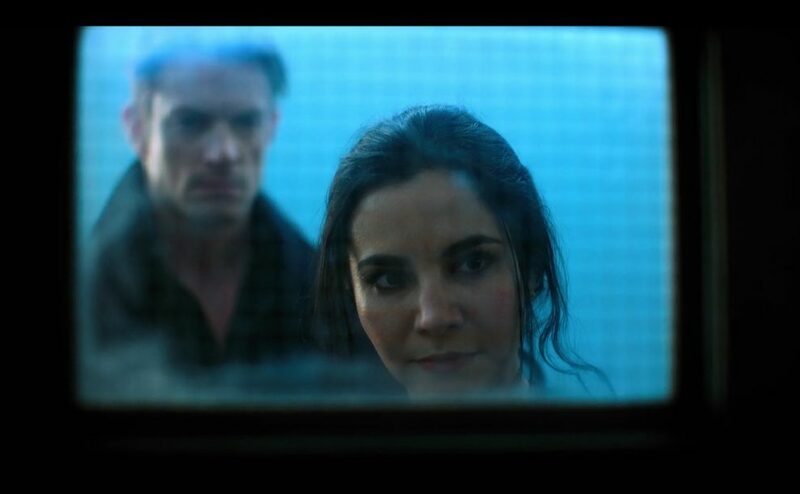 In an extremely interwoven storyline, Ortega’s backstory with Ryker is revealed, along with the importance of the mystery blonde in the morgue, and why Bancroft took a personal interest in inflicting emotional damage on her. 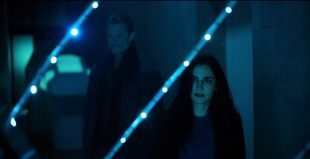 It’s the first episode where Kovacs is fully present, without any Quellchrist memory bleed-throughs. A visit from Abboud helps him crystallize that, regardless of his own personal demons, he’s now the physical embodiment of someone else’s and he needs to tread very carefully if he has any soul left at all. 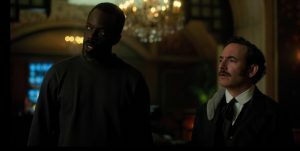 That not-so-gentle warning takes hold and Kovacs tries to do and be a little better now that he knows who he’s wearing, and recognizes a kindred grief-stricken soul in Ortega. Once the truth is out and that anger and animosity fall away, they see different versions of themselves reflected back in each other. Kovacs heads to the Aerium looking for Laurens and instead receives a tantalizing offer from Miriam. He spends a little time with Laurens, too, bearing witness to a particularly macabre PR dog and pony show. The episode also brings the religious zealot angle into sharper focus, although we still don’t know why they’re so hellbent on marking people against being spun up again. The few moments of calm in the episode are violently punctuated by the brutal extremes to which they’ll go to further their cause. Matt Frewer is delightful in a set of scenes that get Kovacs closer to solving Bancroft’s murder. I definitely took his character as a wink nudge to Max Headroom. And Vernon and Poe work on their (often hysterical) relationship while Poe continues rebuilding Lizzie’s psyche. This one was my favorite so far. Aside from the emotional payoffs, there’s a ton going on with the plot. 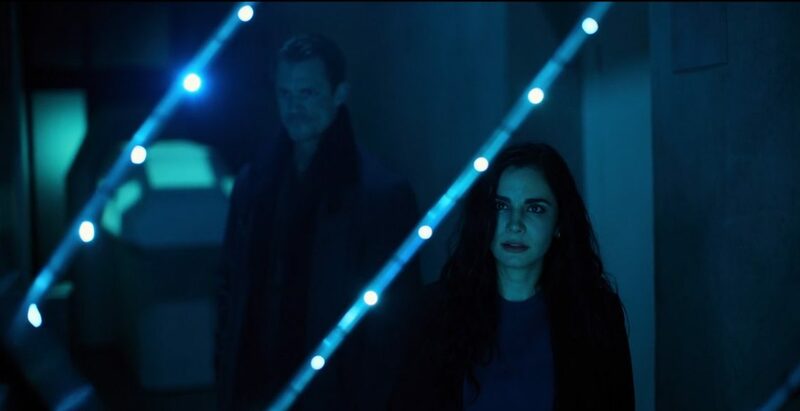 From the outset, I’ve liked the vibe of Joel Kinnaman and Martha Higareda together and wanted to see more of that dynamic, and this episode delivers. It also makes me want to go back and watch the first episode through the lens of this one. 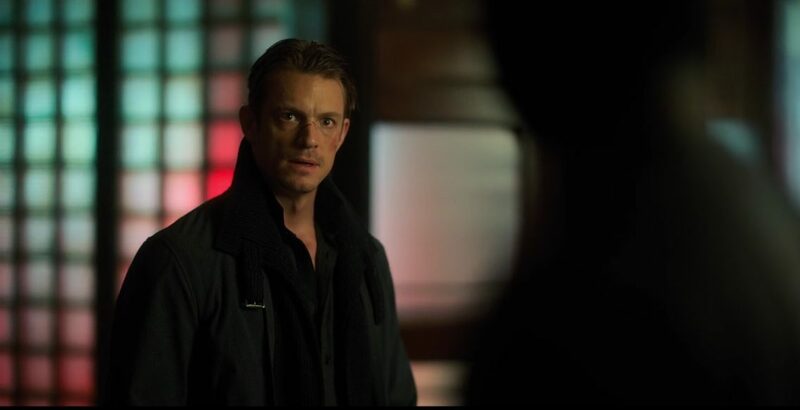 Altered Carbonâ€˜s first season is available now on Netflix.